In 1948, the United Nations General Assembly proclaimed the Universal Declaration of Human Rights, stating every human being’s right of equality in dignity and right. However, notwithstanding recognition by the international community of its importance and codification in numerous national and sub-national constitutions and legislation, reinforced by various multilateral and regional human rights treaties, the right of equality continues to be unable to take complete firm hold in all regions and countries. Evidence, as presented by the insightful papers in this collection, published initially as a Special Double Issue of The International Journal of Human Rights dedicated to exploring the place of equality in Asia-Pacific societies, suggests that although progress is being made the right of equality has not yet fully materialized, both in law and in reality, in the world’s most populous region. Many factors, particularly entrenched cultural heritage and practices, the lingering effects of colonialism and newly found independence, and, above all, pervasive ignorance and prejudices, continue to impede the recognition, development and protection of equality in this region. Of course, equality, a normative right and entitlement by virtue of our humanity, has neither been fully achieved in societies outside the region. Such neo-colonial thinking in fact perpetuates and assists in the subjugation of the right of equality in the Asia-Pacific Region as a matter of relevance and concern only to Western countries. Accordingly, we hope that our discussions will also be able to shed light and generate reflections on realities outside the region as interlinked with our aim. The Editor’s book fee has been donated to the UNICEF Tsunami Fund. This book was previously published as a special issue of The International Journal of Human Rights. 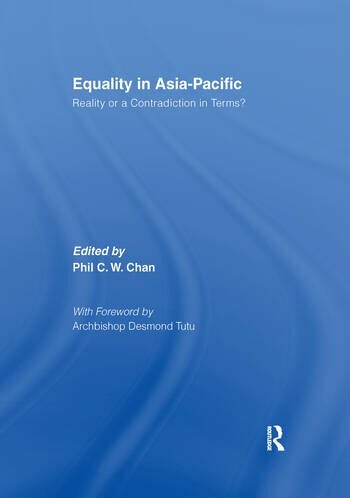 Phil C. W. Chan is Editorial Board Member of The International Journal of Human Rights and the Journal of Homosexuality respectively, and Assistant Editor of the Chinese Journal of International Law.